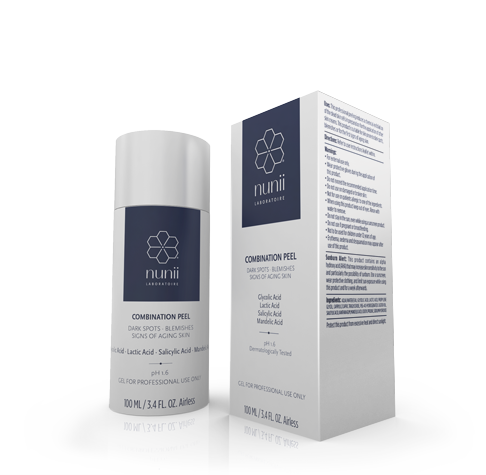 nunii® Laboratoire COMBINATION PEEL for professional use only, is formulated to induce a chemical exfoliation of the dead skin cells in preparation for the application of other skin creams. This product is suitable for skin prone to dark spots and blemishes or for the first signs of aging skin. Glycolic Acid, Lactic Acid, Salicylic Acid, Mandelic Acid, four highly concentrated chemical exfoliating agents to smooth skin’s surface and significantly boost skin’s radiance. - Not for use on patients allergic to one of the ingredients. - Not to be used for children under 12 years of age. - Erythema, oedema and desquamation may appear after use of this product. - Sunburn Alert: This product contains an alpha hydroxy acid (AHA) that may increase skin sensitivity to the sun and particularly the possibility of sunburn. Use a sunscreen, wear protective clothing, and limit sun exposure while using this product and for a week afterwards.